This Endangered and elusive large shrub or small tree grows close to the Georgia-Turkey border. It is predicted to occur within only five geographic sites but is only confirmed in two. Across these two sites in the Shavsheti-Arsiani mountain system, Ajara Autonomous Republic fewer than 150 individuals were found. One subpopulation consisted of just 12 individuals. 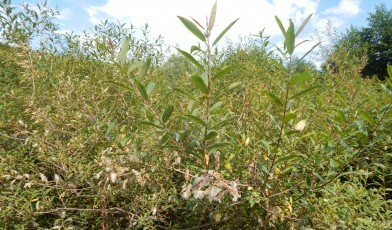 Salix kikodseae is restricted to the subalpine zone and is reported to most commonly occur in stony habitats often on the edge of birch and beech tree forests. However, the two surveyed sites were both relatively wet habitats. Within the Khulo municipality it grew in a wet meadow and in Shuakhebi it was found in a mountain, riparian habitat. Alongside the threat from small numbers and geographic range the species is also at risk from poor natural regeneration which is considered slow. Furthermore, there is local development and expansion of tourist infrastructure which threatens to encroach on the remaining individuals. 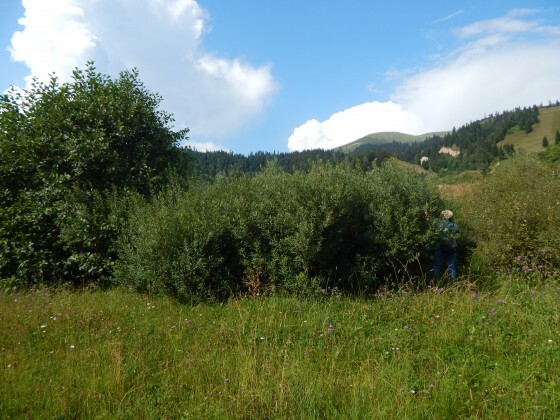 Fortunately GTC partners, at the Institute of Botany, Ilia State University, Tbilisi are in the midst of survey work, public outreach and propagation trials to divulge more about this species and secure the future for this threatened tree. Photos are credited to Giorgi Tedoradze from Ilia State Univeristy and Davit Kharazishvili from Batumi Botanical Garden.